R-Alpha Lipoic Acid (R-ALA), also referred to as Thioctic Acid, is perhaps the ultimate antioxidant, far more potent than well known antioxidants like Vitamins C and E. The addition of Acetyl-L-Carnitine enhances the action of R-ALA to create the perfect anti-aging package. Demand for the combination of these two important products has exploded in recent years and many studies and clinical trials have been carried out. Interest soared after a 2002 study: a team of researchers led by Bruce Ames, professor of molecular and cell biology at the University of California, reported that the combination of these two products had significant anti-aging benefits - considerable improvements in energy levels and memory were observed. A totally natural and unique antioxidant, R-ALA is both water and fat soluble, so acts both inside and outside your cells neutralising and flushing out of the body the worst types of free radicals (a major cause of degenerative disease and cellular aging). As it deactivates both water and fat soluble free radicals, both lipoproteins and membranes are protected - no other anti-oxidant is know to do this. R-Alpha Lipoic Acid, is found in vegetables such as spinach and in red meat. Small amounts are also produced by the body, but levels decline as one ages. 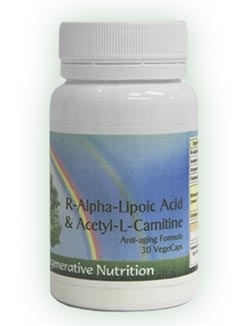 Taking R-Alpha-Lipoic Acid is a convenient way to protect against disease. Acetyl-L-Carnitine is recognised for its anti-aging and energy giving properties. In short, the two are a powerful combination that can improve vitality and help protect against disease. Studies have shown that they work together to "tune up” the energy-producing organelles that power all cells, the mitochondria (seen as the weak link in aging). As we age, the mitochondria decay both structurally and functionally, and the levels of antioxidants in the body fall, both R-Alpha Lipoic Acid and Acetyl-L-Carnitine protect mitochondria function and therefore help to preserve cell function and energy. R-Alpha Lipoic Acid (R-ALA), also referred to as Thioctic Acid, is perhaps the ultimate antioxidant - far more potent than well known antioxidants like Vitamins C and E; the addition of Acetyl-L-Carnitine enhances the action of R-ALA to create the perfect anti-aging package. Acetyl-L-Carnitine is a molecule that occurs naturally in the body with a very similar structure to the well known amino acid carnitine. Like R-ALA, levels diminish over time. In short, the two are a powerful combination that can improve vitality and help protect against disease. Studies have shown that they work together to "tune up” the energy-producing organelles that power all cells, the mitochondria (seen as the weak link in aging). As we age, the mitochondria decay both structurally and functionally, and the levels of antioxidants in the body fall, both R-Alpha Lipoic Acid and Acetyl-L-Carnitine protect mitochondria function and therefore help to preserve cell function and energy. For more information about these two supplements in combination, please refer to the section after the "in depth" sections on each supplement individually, which follow. Why Is Alpha Lipoic Acid Such a Powerful Antioxidant? Unlike other antioxidants which are either hydrophilic (water soluble) or Lipophylic (fat soluble), Alpha Lipoic Acid is both water and fat soluble, this universal solubility means that ALA is able to neutralize both hydroxyl and singlet-oxygen free radicals, two of the most dangerous types, wherever they are found in the body. ALA works to prevent free radical damage regardless of whether it is in the brain fluids, stored in fat, the heart, pancreas, kidney, liver, bone, or cartilage. ALA’s protective effects extend to virtually every cell in every organ and tissue. These characteristics enable ALA to easily cross the blood brain barrier and increase brain energy. ALA has been shown in studies to improve long-term memory in laboratory animals, probably by preventing free radical damage to cell membranes. Additional studies on ALA show it to have a neuro-protective role against various toxic chemicals. Alpha Lipoic Acid supplementation actually gives you two antioxidants in one. As Alpha Lipoic Acid does its work, it is reduced to Dihydrolipoic Acid (DHLA), another important antioxidant that can deactivate peroxyl and other types of free radicals. When DHLA is oxidized (gives up an electron to deactivate free radicals) it reverts back to Alpha Lipoic Acid. This molecular change goes back and forth automatically in the body accomplishing many important and beneficial functions. In order to deactivate free radicals, antioxidants like Vitamin C & Vitamin E, must give up an electron and therefore their effective life is limited. DHLA is able to restore the missing electron and extend the life of these other important antioxidants. DHLA replenishes the antioxidant properties of Vitamin C and recycles Vitamin E in the body so that these antioxidants remain active longer. Burt Berkson, MD, Ph.D. believes ALA to be an excellent therapeutic agent for many types of liver disorders. In his latest book he describes how administering intravenous ALA saved the lives of four patients who had severe liver damage. Four weeks after the intravenous ALA therapy, the four patient’s liver function tests were "normal”. Additional studies indicate ALA may have a beneficial effect on patients with acute and chronic alcohol toxicity. ALA is also an effective detoxifying agent for mercury, arsenic, copper, excess iron, cadmium, excess calcium (a primary cause of premature aging), and lead. Alpha Lipoic Acid functions as a co-enzyme in sugar metabolism. In a study of adult diabetic patients, Alpha Lipoic Acid increased cellular uptake and burning of glucose by approximately 50%. This study showed that Alpha Lipoic Acid could be extremely beneficial to diabetics and those who are borderline diabetic (insulin resistant). In other studies ALA significantly reduced symptoms of diabetic peripheral neuropathy (pain, burning and numbness) in the feet and improved cardiac autonomic dysfunction in non-insulin dependent diabetics. Alpha Lipoic Acid increases insulin sensitivity and optimizes the use of glucose for energy and if glucose can be effectively used as cellular fuel, it will not be stored as fat. In Germany, Alpha Lipoic Acid is an approved treatment for Diabetic Neuropathy where high blood sugar levels over several years cause long-term damage to the nerve fibres, in Diabetics, this normally first presents as reduced sensation in the feet and usually spreads further up the legs. The superior antioxidant properties of Alpha Lipoic Acid help to reduce events in the body that cause the reduced endoneural blood flow and oxygen tension that occurs in cases of Diabetic Neuropathy. Because of its antioxidant capabilities and its ability to boost glutathione production and regenerate other antioxidants, ALA plays an important role in cardiovascular health. Both ALA and DHLA are extremely effective in deactivating peroxynitrite, a particularly dangerous type of free radical that contributes to the development of atherosclerosis, lung disease, neurological disorders and inflammatory diseases. In a pilot study, supplementation with 150mg of ALA 3 times per day was shown to increase plasma ascorbate, glutathione and T-helper cells and to optimize the ratio of T-helper cells to T-suppressor cells. Other studies have demonstrated the ALA helps to inhibit HIV replication by decreasing the activity of reverse transcriptase and to delay apoptosis (programmed cell death) of Thymus cells – the immune system’s number one line of defense. Alpha Lipoic Acid is particularly helpful for removing mercury and cadmium, which it binds to and neutralises. Neuropharmacology Laboratory, Department of Pharmacology, All India Institute of Medical Sciences, New Delhi 110029, India carried out a study on rats and those treated with Alpha Lipoic Acid showed significantly less cognitive impairment. There was also an insignificant increase in oxidative stress in the alpha lipoic acid treated groups. The study demonstrated the effectiveness of Alpha Lipoic Acid in preventing cognitive impairment, which indicates the usefulness in the natural treatment of Alzheimer's disease. There is overwhelming evidence that this disease is focused around heavy metal toxicity in the brain and that there have been cases of reversal from Alzheimer’s using a heavy metal detox programme. Alpha Lipoic Acid can remove mercury from brain and nerve cells, but to transport it out of the body, and stop it depositing elsewhere Sea Greens are required. In addition, clinical studies have seen the slowing down of progression, and improved cognitive ability of Alzheimer’s patients when an Acetyl-L-Carnitine supplement is introduced, so the two products together should be seen as an essential supplement for Alzheimer’s cases. The human brain is uniquely powerful and complex, but it is difficult for it to fully recover from damage. People affected by stroke, traumatic brain damage or age-associated dementia know this too well. Research studies suggest that the vitamin-like nutrient L-carnitine may be able to slow down, or even reverse, brain deterioration in addition to giving people the ability to think clearer and have improved memory. "significant capacity to slow, and even reverse, the effects of aging on the brain"
Dr. Russell L. Blaylock in Health and Nutrition Secrets. So, how exactly does ALC work? It is able to travel through the blood-brain barrier, where it then helps form the brain chemical acetylcholine; it keeps mitochondria working efficiently by clearing them of toxic fatty-acid metabolites; and it helps regenerate neurons damaged by free radicals. The results of numerous research studies support this model. These studies include electron microscope analysis of the hippocampus region of the brain, which demonstrated ALC's ability to reverse the age-related deterioration of mitochondria. Furthermore, according to Professor Gary Null, autopsies show that people who had Alzheimer's experienced 25 to 40 percent less ALC transferase activity than people without Alzheimer's. In other words, perhaps the reason why ALC supplementation is so beneficial to Alzheimer's patients is because they are deficient in L-carnitine in the first place. Of course, the benefits of ALC's ability to regenerate lost brain function extends far beyond Parkinson's and Alzheimer's disease, making it a promising treatment for victims of stroke as well. If it is administered to stroke victims soon after the stroke occurs, ALC may actually reduce the level of brain damage caused by the interrupted blood flow, according to an Italian animal study reported in Dr. Russell L. Blaylock's Health and Nutrition Secrets. But even if it was not possible to give a patient ALC soon after the stroke first occurred, ALC supplementation may help the patient improve memory, task performance and cognition during his or her road to recovery. Furthermore, ALC may even be able to help people with Down's Syndrome, even though it is a congenital disease, rather than an age or trauma related one. In one 90-day study, ALC supplementation improved both the visual memory and attention of test subjects with Down's Syndrome. Further research into this scope of ALC's benefits should be promising. Can Acetyl-L-Carnitine boost brain function? If ALC supplements can help normalize the mental activity of people with neurological damage or deterioration, can it boost the brainpower of anyone? Many experts have asked the same question. In Mind Boosters, Dr. Sahelia writes: "Acetyl-L-carnitine is an antioxidant involved in energy utilization within cells" Taken "...in the morning before breakfast works within two to three hours to induce a pleasant visual and mental clarity." Similarly, Bottom Line Personnel's 2004 Bottom Line Yearbook reports that ALC can "jump-start" the brain, and Dr. Blaylock believes that ALC improves spatial learning, long-term memory and discriminatory learning. Given the fact that the acetyl component of ALC is an important neurotransmitter and L-carnitine itself helps increase cell energy, it isn't illogical to believe that ALC may offer mental-boosting effects, but experts' opinions are not unanimous. For example, Textbook of Natural Medicine authors Joseph E. Pizzorno and Michael T. Murray report that ALC supplementation may only be beneficial to people who are actually deficient in L-carnitine, such as people with age-associated mental deterioration. Because scientists do not know the long-term health effects of ALC in large doses, Dr. Elson Haas cautions, "This is basically safe and can be taken over an extended period, although it probably should be stopped for one week each month, until its long-term safety as a supplement is more clearly established." Based on the opinions of Dr. Haas and other experts, this may be a safe way to see if ALC works for you. The initial excitement about ALC/ALA supplementation began when a team of researchers in California fed elderly rats both nutrients for a period of seven weeks and then compared them with young rats. They were testing the theory that mitochondrial decline is caused by free radical damage. There was already evidence that supplementation with acetyl L-carnitine (ALC) could reverse the age-related decline in mitochondrial activity in rats, increase fatty acid oxidation and boost general metabolic activity. However the down side to this increased mitochondrial function was that more oxidative damage occurred, so the researchers decided to add the powerful mitochondrial antioxidant alpha lipoic acid (ALA) to the mix to see if they could get the best of both worlds: increased mitochondrial energy output, with reduced mitochondrial damage. This two-pronged ‘punch’ to ageing cells seemed to work, with the two supplements together producing better results than either one alone. After a month on the supplements, elderly (24-month-old) and lethargic rats had more energy and did better on memory tests, while their mitochondria worked better. The decline in overall activity typical of aged rats was reversed to the level of young-to-middle-aged adult rats, aged 7-10 months. The researchers likened this result to a group of 80-year-old humans throwing away their walking sticks and starting to act 35 years younger! These studies on rats caused a huge stir within the scientific community. Here was evidence that some of the processes of ageing could be slowed or even reversed, and the implications for human health and performance were enormous. In the months that followed, a number of human studies were started, many of which are still under way. One of the earliest studies examining the effect of acetyl L-carnitine (ALC) and alpha lipoic acid (ALA) in humans was carried out at San Francisco State University in 2001. In a double-blind, placebo-controlled study lasting 17 weeks, 18 healthy sedentary men aged 60-71 were randomised to one of two treatment régimes: a placebo tablet twice a day or acetyl L-carnitine (ALC) and alpha lipoic acid (ALA) twice a day. Both groups were then asked to perform a demanding sequence of exercises, after which blood was drawn and analysed for signs of exercise-induced oxidative stress (a potentially damaging by-product of energy production). To measure oxidative stress, the study evaluated nine different biomarkers: ammonia, beta-carotene, glutamine, glutathione, malondialdehyde, total antioxidant status (TAS), vitamin C, vitamin E-alpha tocopherol, and vitamin E-gamma tocopherol. For eight of these nine biomarkers, a majority of subjects in the treatment group recorded values indicating that levels of oxidative stress had fallen. By contrast, no such benefits were reported in the placebo group. If an acetyl L-carnitine (ALC)/alpha lipoic acid (ALA) combination can reduce exercise-induced oxidative stress, that would be good news for athletes, who are particularly vulnerable to such stress. However, because the small scale of this study made it difficult to reach statistically significant conclusions, the results were not submitted for scientific publication, which means they should be interpreted with caution. Other human studies are also currently under way, but so far there are no published human studies available, although positive studies in animals continue to proliferate. For example, American researchers demonstrated that alpha lipoic acid (ALA) supplementation in older racehorses reduced the oxidative stress burden even under light training loads, while a number of other animal studies have shown that acetyl L-carnitine (ALC)/ALA supplementation reduces oxidative stress and improves mitochondrial function in a number of tissues, including brain, muscle and heart. In one of these studies, researchers examined the effects of acetyl L-carnitine (ALC)/alpha lipoic acid (ALA) therapy on ageing and hearing in rats, and found that it reduced the normal age-associated deterioration in auditory sensitivity and improved inner ear function. They concluded that these improvements were related to the acetyl L-carnitine (ALC)/ALA combination’s ability to protect and repair age-induced mitochondrial DNA damage, thereby boosting mitochondrial function and improving energy turnover.